Opening venue of the national exhibition organized by the Missouri Historical Society. Visitors will have a once in a lifetime opportunity to step into a lost America. Marvel at the historic and ethnographic treasures that tell a two-hundred-year-old story that changed a continent. The Osage people have impacted the socio-political and economic history of the Midwest region and Mississippi Valley. Their stewardship of the plains, prairies and woodlands has profoundly shaped our environment today. A highly consistent aesthetic is expressed in works of art made of bead, ribbon, feathers, fur, quill, metal, fiber, wood, stone and bone. Moccasin. Leggings, skirts, shirts, mantels, bead and body ornaments, weaponry and domestic, as well as ritual objects, convey the rich and textured symbolic world of the Osage people. This film will be shown at the Science Center as well as a small exhibit on the scientific and technical aspects of the Lewis and Clark Expedition. A self-guided walking tour of the zoo will highlight the animal life discovered by Lewis and Clark. Special exhibit highlighting the plant life discovered by Lewis and Clark. More than 150 new species were discovered. A hands-on exhibition for children, the Lewis & Clark Discovery Trail will simulate the landmarks and challenges that the Corps of Discovery faced along their journey. Seaman, the expedition’s trusty Newfoundland mascot, will be the guide as children (ages 6 through 14) become members of the Corps Crew. An exhibition will tell the story of York, William Clark’s slave, who was a part of the Corps of Discovery. This giant screen tells the story of Meriwether Lewis and William Clark’s exploration of the Louisiana Territory and their journey westward to the Pacific Ocean. An exhibit on display in the Museum of Westward Expansion emphasizing the Wood River/St. 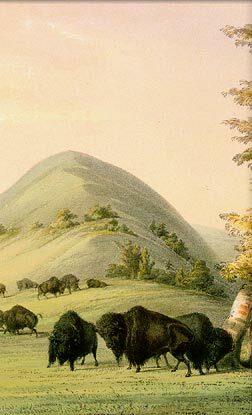 Louis/Cahokia phase of the Lewis and Clark journey, with information on the Spanish colonial government, acquisition of supplies, training of the men, diplomatic negotiations and other events which took place between December 1803 and May 1804 in the area. Visitor center located near the former Camp Dubois where explorers Lewis and Clark wintered before they embarked on their great trek west. Includes orientation film, a 55-foot-long keelboat replica and exhibits on the Louisiana Territory and the American Indians who lived there. Brand-new facility (to open in 2003) on the Missouri riverfront in the area where Lewis and Clark departed for their incredible journey. This will house the three replicas of the boats used by Lewis and Clark to explore the Louisiana Territory 200 years ago. In addition, the museum upstairs features exhibits about the expedition and will focus on the unique St. Charles townspeople and the role they played in the expedition. This 60-minute, one-act opera tells the story of the Corps of Discovery's expedition to the Pacific Ocean. Written by composer Stephen Mager and librettist Elkhanah Pulitzer, the opera features a cast of four adults and 24 young people. Throughout 2004-2006, the opera will tour cities throughout the United States, including final performances in Washington, D.C. Description: This week-long workshop will focus on the Lewis and Clark Bicentennial, with an emphasis on the newly-commissioned young people's opera, Dream of the Pacific. The workshop will acquaint participants with the multidisciplinary, grades 4-10 curriculum developed for the Bicentennial by Opera Theatre of Saint Louis. Daily sessions run from 9 a.m. to 4 p.m. Cost is $100-$125; graduate credit (3 hours) is available for an additional fee. This camp (for kids entering grades 4-6 in fall 2004) will introduce students to the magic of opera, focusing on Dream of the Pacific, the new young people's opera commissioned for the Lewis and Clark Bicentennial. Daily activities include singing, acting, dancing, theater games, music composition, libretto-writing, backstage tours, visits with professional opera singers and more. Campers will also attend a performance of Dream of the Pacific. Cost is $100. Space is limited; sessions run from 9:00 a.m. to 2:30 p.m. Among the many famous St. Louisans buried here is explorer William Clark. Maps and self-guided tours available at the cemetery office. This trail (rail trail) traces Lewis and Clark’s route on the Missouri River for 165 miles from St. Charles to Franklin. The Manitou Bluffs noted by Clark in his journal can be seen from the trail. Hiking or bicycling is the mode of transportation. Interpretive signs dot the trail for informative historic information. Members of the Lewis and Clark expedition camped across the river from the fort (which was built in 1805) site at the beginning of their voyage on May 14, 1804, as well as on the final night of their expedition on September 22, 1806. On the last occasion, the time was spent resting and celebrating their return to civilization with the fellow American soldiers stationed at this outpost. Chief Sheheke (Big White) of the Mandans returned with the expedition and received clothing from the post’s public store in preparation for his trip to visit President Jefferson in Washington.